filaments: narrow threads (~ 1 pm wide) consisting of disk-shaped cells and larger filaments (~ 10 pm in diameter) made up of barrel-shaped cells enclosed by a multilamellated sheath. From 3.2-billion-year-old Mesoarchean rocks of the Cleaverville Group, Pilbara Craton, Kiyokawa et al. (2006) described an extensive stromatolitic layer, which extends for > 1 km and contains wavy, colloform laminations similar to those seen in columnar stromatolites. Within the same carbonaceous Black Chert Member, a diverse microbiota is preserved in silica, including six morphological types: (1) spiraled structures 50-150pm long and 10 pm wide; (2) rod-shaped filaments 50-80pm long, with cell walls ~2-5pm thick; (3) delicate, short filaments, which are compared to Primaevifilum from the Apex chert; (4) branching, dendritic filaments (FIG. 2.17) 100 pm long and 1 pm in diameter, which appear to be made up of small rod-shaped units; (5) carbonaceous, mat-like material that may represent part of a biofilm; and (6) spherical masses of carbonaceous material. 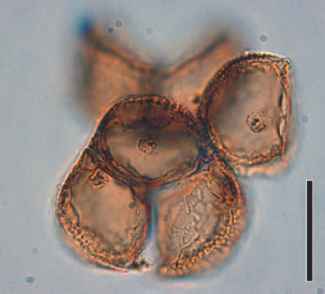 The putative microbial fossils are syngenetic, that is, they were there at the time the rock formed and are preserved in three dimensions in the fine chert. 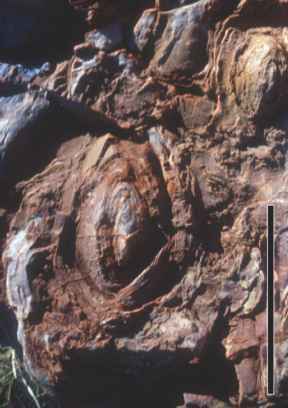 Beukes and Lowe (1989) reported on 3Ga stromatolites from South Africa (Pongola Supergroup) that they believe were formed in a range of shallow depositional settings, including intertidal mud flats and subtidal channel environments. Noffke et al. (2008) reported microbially influenced sedimentary structures (MISS) from ancient tidal flat facies of the 2.9 Ga Pongola Supergroup, South Africa, which are similar to the Paleoarchean ones described earlier (Noffke et al., 2006). They delimit four levels of microbial mats, which can be distinguished by their specific MISS, and which also occur in modern tidal flat settings. Although the analogous modern features are formed by benthic cyanobac-teria, what types of microorganisms formed the fossil features remain unknown.